This document is designed to show that using git on Windows is not a difficult process. In this guide, I will create a repository, make several commits, create a branch, merge a branch, search the commit history, push to a remote server, and pull from a remote server. The majority of this will be done using GUI tools. Although this guide is targeted for use on Windows, the git gui tool works the same on all platforms. Because of this, git users on other platforms may find useful information here as well. via An Illustrated Guide to Git on Windows. It supports UNICODE and over MAX_PATH 260 byte pathname files. It automatically selects different method according to whether Source and DestDir are in the same or different HDD. Diff HDD	Reading and writing are processed respectively in parallel by another thread. 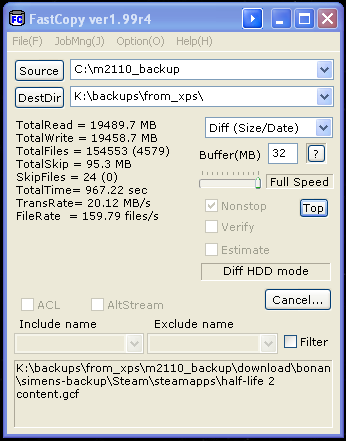 Same HDD	Reading are processed until the big buffer fills. When the big buffer filled, writing are started and processed in bulk.Because Reading/Writing are processed with no OS cache at all, other applications aren’t easy to become heavy. You can modify this software, because all source codes have been opened to the public in the BSD license. Justin writes: It all started with a simple bug encountered while trying to get PHP and WCF to play nice. Before you know it I was attempting to compile PHP on windows myself. That’s when I realized how deep the rabbit hole really goes. via Microsoft won’t tell Zend how to build PHP on Windows. Windows 7 interface (and desktop) is rather clean and minimalist. Of course, you can find everything you need in the famous and well-known Control Panel. However this solution won’t allow you to see and easily use all those nested settings included in the main options. Did you know that you can become a God? Well, at least on Windows 7!